Where did the name IZULA come from? The locals in Peru call the meanest, nastiest ant of the jungle by the name "Isula" (photo below on Desert Tan IZULA knife). We know it as the Bullet Ant. The Bullet Ant is known to be independent, tough, light on its feet, and a real aggressive survivor - the IZULA knife is built the same way. 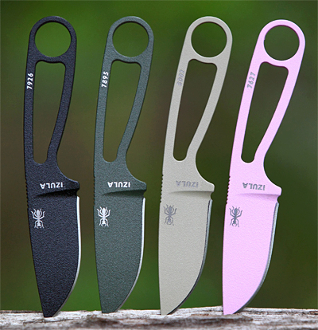 This knife is designed to be the perfect lightweight survival kit or concealed carry knife. Complete IZULA kit includes: Ambidextrous Sheath, Belt clip plate, Paracord (for cord wrapping handle or use as a lanyard), cord lock, Snap (for snapping system on to outdoor gear), Split Ring, Fire Flint, Whistle, and Instruction Sheet.